Any big-ticket spending requires you to either have the required funds in place or a financing option. 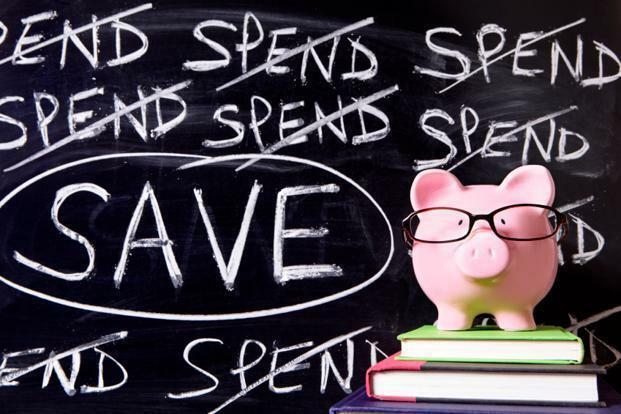 When dealing with long-term financial goals, such as higher education of children, you have the advantage of planning much in advance. Here’s how you can go about the planning. A lot of parents have an inclination to send their children abroad for higher education, at least at the post-graduate level, said Suresh Sadagopan, a certified financial planner and founder of Ladder 7 Financial Advisories. “In that case, the planning needs to start really early. They would need a horizon of at least 10-15 years. When we talk of international education at post-graduate level today, most likely it is not going to happen below ₹40 lakh,” he said. How do you work towards saving that amount? Prakash Praharaj, founder, Max Secure Financial Planners, said that the future cost of a particular course needs to be calculated taking into account at least 10% annual inflation. “Then calculate the current assets and investments accumulated for these goals. Then the remaining gap for the aimed amount is to be filled through monthly SIPs over the years,” he said. Starting an SIP of ₹5,000-7,000 in an equity fund for 15 years and increasing it by 10-20% each year could help. However, Sadagopan said, given the fact that there are so many ongoing expenses these days, including other loans, it becomes difficult for parents to put aside a huge amount for the child’s post-graduation alone. Even if you have been working on creating a higher education corpus, you need to consider taking an education loan. At present, the total expenses for higher education abroad could be in the range of ₹1 crore per child, Sadagopan said. “A realistic thing that parents need to realise is that the child’s higher education is not their only goal. Retirement is also an important goal and they need to be aware of the fact that you can get a loan for all other requirements but not for retirement,” he said. But if someone has already accumulated the required amount, why should another repayment burden be taken on? The answer lies in two things, Praharaj said. “A cost benefit analysis suggests that taking an education loan and keeping the accumulated amount invested works in your favour. Moreover, it also helps in developing a sense of responsibility in the student. The realisation that a repayment has to be done by them keeps them focussed,” he said. The math of keeping your accumulated savings invested and taking an education loan instead suggests that taking a loan results in significant benefits. 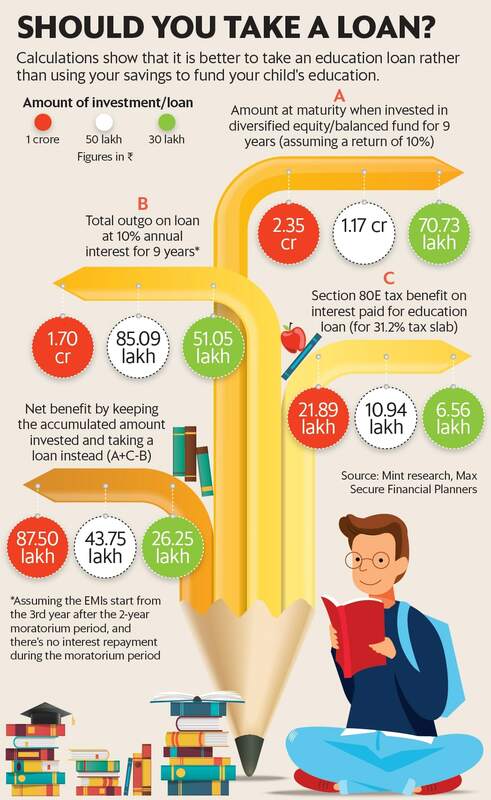 For instance, if ₹1 crore is kept invested and an education loan for the same amount is taken, at the end of nine years, including the repayment holiday on the education loan, the net benefit could be around ₹87 lakh (see graph). This includes the tax saved on repayment of loan. Borrowers of education loans can claim deduction on the interest paid, though not on the principal amount. Also, unlike in home loans, there is no limit to the amount that can be claimed as deduction. Sadagopan said it is better that the parents keep the money with themselves and let the child take the loan. “In future if the child is struggling to find a job and pay back, you can step in to help at that point,” he said.